State of the Art Laser Quality Control System. Cannon uses precision measurement techniques to guarantee and maximize product quality. At Cannon Industries we take our certifications seriously, maintaining our quality control practices, training our people and upgrading our equipment regularly. We do this because we understand that we must earn the trust of our customers every day, at every step in our process. From customer interaction to product fabrication and delivery. 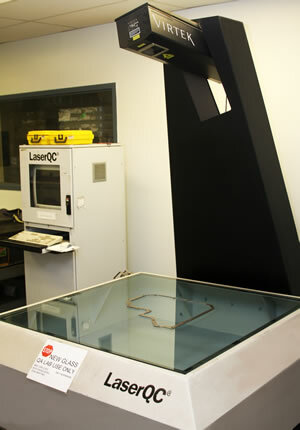 We use the most up-to-date measurement techniques to maximize quality production. We inspect incoming materials to be certain that they measure up to our own quality standards, and examine all purchase orders for accuracy. We use hands on audit and inspection procedures, so that every part receives a final “stamp” of Cannon approval. We implement performance tracking and measurement procedures, ensuring that our production departments are working at full efficiency and accuracy. We have our customers certify that finished parts meet their quality expectations. We record our procedures for receiving components in writing, guaranteeing that the best in class methods are used repeatedly throughout the process. We implement a Quality Cost Program to keep our cost-per-job at a minimum level for our customers, without compromising product quality. We maintain a Reliability Department for supervision of all of these procedures.